Did Uncle Leonard attack a young boy? An escape artist plunges into the icy waters of Montreal’s St. Lawrence River, chained and nailed into a coffin—and never breaks free. After they dredge him from the waves, Dr. Hope Sze resuscitates him, saving his life. When he regains consciousness, but not his memory of the event, he hires Hope to deduce who sabotaged his act. Even as she probes the case, and the strange world of magic and illusion, she must confront her own fears of death on the palliative care ward—and tackle the two toothsome men who can’t wait for her to choose between them. One missing uncle. One missing child. And a river that could kill them both. One of the best crime novels of 2016, as chosen by CBC's The Next Chapter. Two doctors. One killer. One woman in labour. When Dr. Hope Sze trades the crime-ridden city of Montreal for a fishing trip with her dad, she expects misty lakes and crimson maple leaves. In other words, a perfect family fun day. Then Hope’s mother—never the sharpest scalpel in the neighbourhood—drags along crazy uncle Leonard, transforming Black Donald Lake into a very dark place. A story of three women, linked by blood and diamonds. A sociopath on the loose. Dr. Valerie Chia strides into St. Joseph's emergency room expecting the usual Montreal Monday morning chaos. Nothing she and the other day doctor can't handle, with the help of the nurses and a little coffee. Until the other day doctor doesn't show up. And one of the overnight patients crashes. And the shiny new resident doctor, Hope Sze, tries to save the patient’s airway, but just might end up killing the woman instead. Debut episode (half-hour pilot script) of a medical radio drama featuring Dr. Hope Sze, by Melissa Yi, a.k.a. 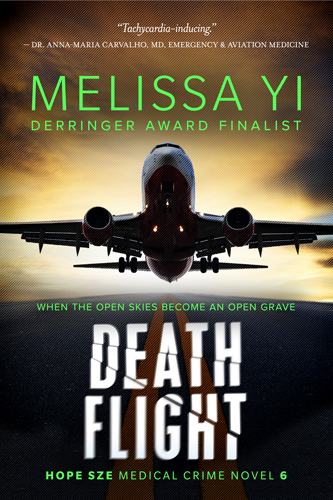 Melissa Yuan-Innes, the emergency physician and award-winning author. A dead man in the snow shatters Dr. Hope Sze’s peaceful month of research at an Ottawa stem cell lab. One man’s body leads to a series of corpses, both at home and around the globe. This time, the killer knows no borders and no conscience. Hope must extricate them all, while caught between the man who saved her life, the man who helps rebuild it, and a killer on an intercontinental rampage.